If you're a fan of comics and you haven't read this book, stop what you're doing and go and find it. 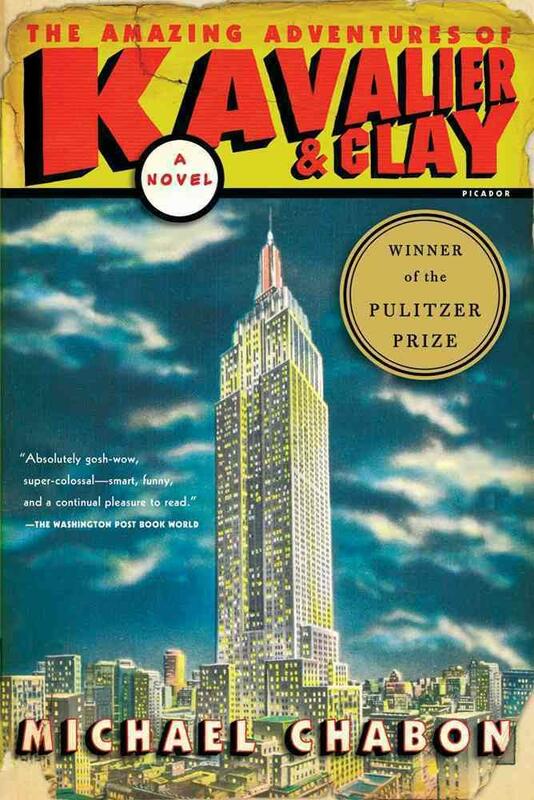 If, like me, you keep finding yourself enchanted by the sheer depth and complex beauty of Michael Chabon's writing and haven't read this book yet, put it on your list and read it. You won't be disappointed. A glorious sprawling love letter to the early days and genesis of what would be the modern comic book, the story of Joe Kavalier and Sam Clay spans both the globe and decades- ranging from Joe's escape from Prague as the Nazis clamp down and close in, leaving his family behind to an uncertain fate, to Sam's fast-talking hustle that conceals a vast imagination and a talent for writing that meets it's match in Joe Kavalier's artistic abilities on the streets of 1930s New York City and helps bring The Escapist to life. As Sam dreams up more heroes and heroines to join The Escapist, their fame and fortune only grows as the beautiful Rosa Saks enters their orbit and falls in love with Joe, who, having escaped from Czechoslovakia, now obsesses over liberating his family from the darkness engulfing Europe- only to find that the one chance he has to do so might have come too late. Like so much else, the lives of the trio are forever disrupted by World War II and when it's all over, their lives, dreams and ambitions are forever changed and altered. I'm honestly surprised that no one has made a movie out of this yet- it's a little dense, in parts- but as a period piece, there are echoes of The Great Gatsby and it's tragic love story- and actual real life people (Al Smith, Stan Lee and other comics legends) wander in and out of the story. You can also tell that Chabon has done his homework about Houdini and the art of escapism (young Joe actually trains with a magician, Kornblum) who is proficient in the art- so the somewhat harrowing details of Joe's escape from Czechoslovakia feel real as well. In fact, if you step back and look at it once you're done, it actually could work very well as a comic book/graphic novel, which is probably what Chabon intended- and to be honest, that's what I enjoy so much about his writing- it might take awhile, it might be incredible subtle, but in every instance where he sets a character or the plot up for something, it pays off- or it comes full circle. I remember reading a random sentence about mid-way through about something one of the characters is doing and had to go back several pages to find out when she actually started doing it. The sheer amount of research that Chabon did for this book is also obvious- in fact, he acknowledges his sources at the end of the book and it's a long list- but the cumulative effect of that research is seen in the overall arc of the book. It transformative, even transportational in a way that you don't often find in many other period pieces. You feel like you've been dropped into the immigrant experience of 1930s New York. You explore the Jewish-American roots of many superheroes, the charges that comic books encourage homosexuality (especially tragic for Sam) and the journey from idea to product that is just a joy to read about. I almost wish that they could have stretched the story just a decade more when the Silver Age of Comics really kicked off and they came back in a big way- but the way this ended- and it was in a way you weren't expecting at all, in many ways, was beautiful and just about perfect. I closed the book, put it down and said "wow." Overall: Dense and involved, The Amazing Adventures of Kavalier & Clay is an epic adventure in every sense of the word at the dawn of what was become a defining genre of American pop culture of today.It might take you a little bit to dig into it, but once you're in, you're in- and you won't stop turning the pages until the end of the book. **** out of ****.